I ordered this cute pink blush from Etude House online and it arrived 2 days after. At first, I was really more into the packaging because it’s just irresistible. I’m a sucker for anything kawaii and pink. Goodthing I discovered this Korean brand of cosmetics. The cookie blusher actually comes in 5 different shades. 1. Pink 2. Rose 3. Orange 4. Sugar Pink and 5. Lovely Pink. I got the Pink shade since it looks not too light and yet not too dark in the picture online while I was browsing. 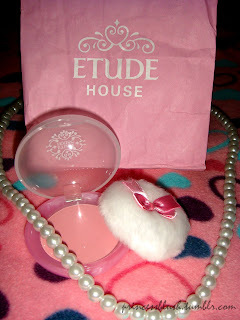 It also comes with a cute blush puff with a cute bow on top of it. Reaally cute! When I tried it, I was a bit disappointed because it turned out too light. You need an ample amount to get that rosy pink glow on your cheeks. Compared to my other blushes which I only need 1-2 strokes on my cheeks, this one needs more application. But when you get the desired pink glow it actually turns out pretty cute. I prefer using this with my own blush brush so I can apply it well on my cheeks.